Innovative Initiatives Series Innovation leaders/authors provide a presentation to help GSFC researchers increasingly expand their thinking about new, innovative processes and ideas. Typically occurs 2-4 times per year (e.g., announced via GSFC’s internal Dateline postings). Event typically involves a 1-hour presentation and Q&A session. Innovation Roundtable Innovation leaders/authors conduct a roundtable meeting with NASA leaders to more deeply brainstorm how GSFC can innovate and collaborate more effectively. Typically occurs 2-4 times per year (e.g., announced via Dateline). Event typically involves a 60-90 min. lunchtime roundtable meeting by invitation (often conducted the same day as the Innovative Initiatives Series event). NTR Program The SPO and OPC recognize NASA inventors for submitting New Technology Reports (NTRs) and related innovative / collaborative achievements. Includes an innovation speaker. Held annually (often in Spring) and is advertised by invitation (2-hour event). 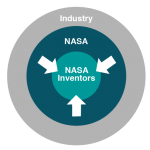 Innovator Training Provide an introductory orientation on what GSFC inventors need to know about technology transfer, SBIR, and partnerships (i.e., how the SPO can be of benefit). Standard, 2-hour sessions are held 2-4 times per year (e.g., announced via Dateline). Customized sessions are provided to various GSFC Code & Mission representatives upon request. Ad Hoc SPO Presentation to Codes/Missions Provide an orientation (introductory or specific) to GSFC researchers regarding technology transfer, SBIR, and partnership (i.e., how the SPO can be of benefit). SPO representatives can provide guest talks of varying length at Code/Mission staff meetings upon request. Contact the SPO via techtransfer@gsfc.nasa.gov or 301-286-5810 to suggest new SPO initiative ideas.